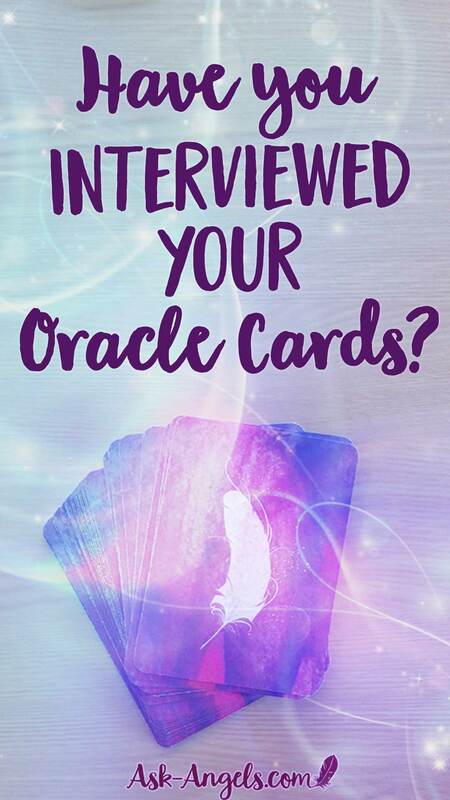 Have You Interviewed Your Oracle Cards Yet? Ready to get to know your Oracle Cards and empower more accurate readings? You're about to learn how to Interview your Oracle Cards which will help you to more deeply connect with them! The biggest factor for receiving clear, accurate and detailed guidance using Oracle Cards is, of course, your direct connection with Spirit. You have to be willing to become fully present and open to Spirit to really tune into that level of consciousness and awareness. Really feeling attuned and connected to your deck of Oracle Cards is immensely supportive too! 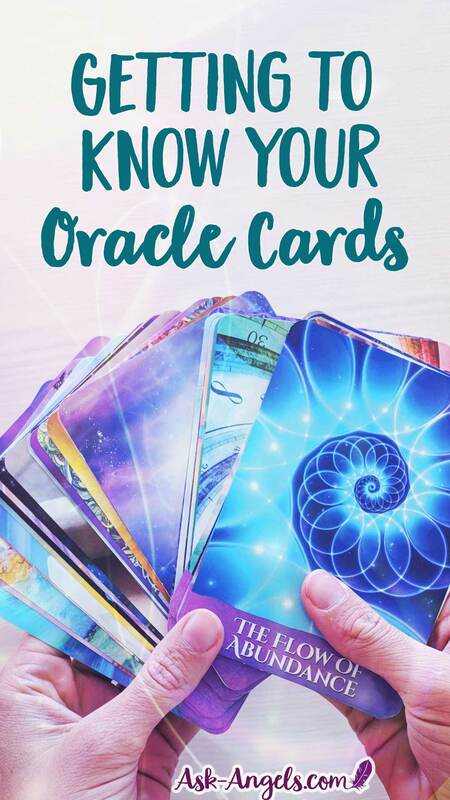 So… How do you get to know your Oracle Cards? When you start working with a new deck, or if you want to rekindle your relationship with an existing deck, I have a few helpful hints for you including a powerful Oracle Card Spread you can use to interview your deck! Before we dive into interviewing your Oracle Cards, it is important to begin by cleansing them! I personally like cleanse new decks by smudging them with sage, and then consciously calling forth the angels and the light to cleanse the cards and raise their vibration. While cleansing your cards is a required step… There are many ways to do it, so find what feels right and works for you! Once you’ve cleansed your cards… It’s helpful to then start getting a feel for the deck. I like to begin by holding the deck in my hands and flipping through the cards, gazing into every image, reading the card titles and really just feeling into the vibration and energy of the deck as a whole. As you do, this, pay attention to cards that really speak to you, themes that jump out at you, as well as your general intuitive feelings around the deck as a whole. You don’t need to draw any conclusions, or look for anything specific here… Just take some time to play with your cards and start tuning into the magic and frequency they’re here to help you access! When you’re ready to dive in, shuffle your cards, and complete your first Oracle Card Reading with your new deck… An interview spread is a wonderful place to begin. I actually learned about the idea of an Interview Spread on Pinterest … There are quite a few variations and while I couldn’t seem to find the original source, I can say, this is a wonderful way to get to know your deck! Completing an interview reading is essentially just about engaging in a conversation with your deck. All decks are different in their perspective, strengths and focus… The interview spread is a great way to gain insight into what your deck is here to help you with, what its strengths are, and how you can best work together! I’ve tried many variations of this reading by interviewing all my Oracle Card Decks… And this is the spread I’m most resonating with now. Tell me about your energy… What energy do you shine and vibrate with? What are you here to support me with and teach me? What do you ask of me in working together? How can I best work with you? How can we successfully collaborate? What is the potential outcome of our working together? What else do I need to know about you or about tuning into guidance from Spirit together? 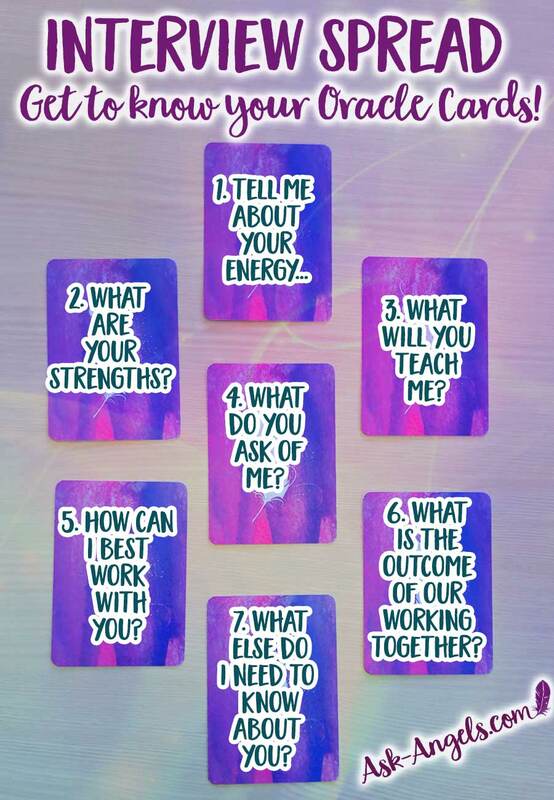 The Interview Spread is a lovely way to get to know your deck and to gain insight into how you can best work with it to empower others and receive clear and accurate intuitive guidance for you! Have you tried this spread? Comment below and let me know how it goes for you! Want further assistance receiving clear and accurate guidance using Oracle Cards? 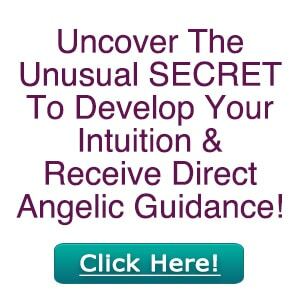 Check out my Angel Intuition Course here! Top 5 Ways to Shuffle Tarot Cards! Works For Angel Cards & Oracle Cards Too!